We’re most familiar with vodka as a component for mixed drinks and straight-up shots alike, but the traditional Russian cure-all has lesser-known benefits beyond a pleasant buzz—in fact, it’s a seriously versatile kitchen standby that can be used for quite a few beauty benefits. It’s good for your hair, skin, and even your breath (you’ll see what we mean). 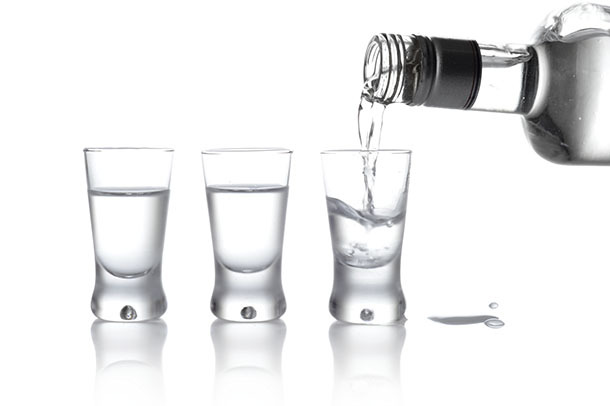 So before you write vodka off as just another bar staple, give these 5 tricks a try. Vodka has a low pH level, which helps to close the hair’s cuticle for shiny, frizz-free strands, even on super damaged hair. Use chilled vodka as a post-conditioning rinse (the smell dissipates quickly, we promise) or mix a shot into your deep conditioner. If you have virgin hair, you can use a vodka rinse as often as you like, but colored hair types should stick to once-a-week treatments—and all hair types should always be sure to condition well to avoid dryness. Vodka’s astringent, pH-balancing qualities also make it a great way to clarify your hair and scalp when you’re working with a little too much buildup. Mix a shot of vodka in with your shampoo and massage vigorously (but gently!) into the scalp to deep clean and leave a smooth, shiny finish free of oily buildup. Mix equal parts vodka and water and apply to your face with a cotton ball in circular motions for an effective, bacteria-fighting natural toner. It’ll tighten your pores and dry up any blemishes. You can also customize your DIY toner with other skin-nourishing ingredients like rose water or lavender oil. Yes, we’re instructing you to put vodka in your mouth without swallowing it. The liquor’s astringent, anti-bacterial nature will kill bad breath germs and freshen your mouth in just a swish. We regularly use razors to shave, but they can get rusty and accumulate bacteria that makes them less than pleasant to use. Soaking razorblades in vodka immediately after shaving will prevent them from gathering anything gross that you wouldn’t want on your skin. Plus, you’ll save money, since it’ll keep your razors fresher for longer.